Scattered around PICTORIAL B1, there are 10 small, red-orange circles with the numbers 1 through 10 next to them. These represent spaces where you might want to put RESIDENCES. Perhaps they could all be Plastered Straw Bale Houses. As the design above shows, they could be 35-foot diameter, 962 square feet each, for one level or floor, and double that, 1924 square feet, counting both floors. 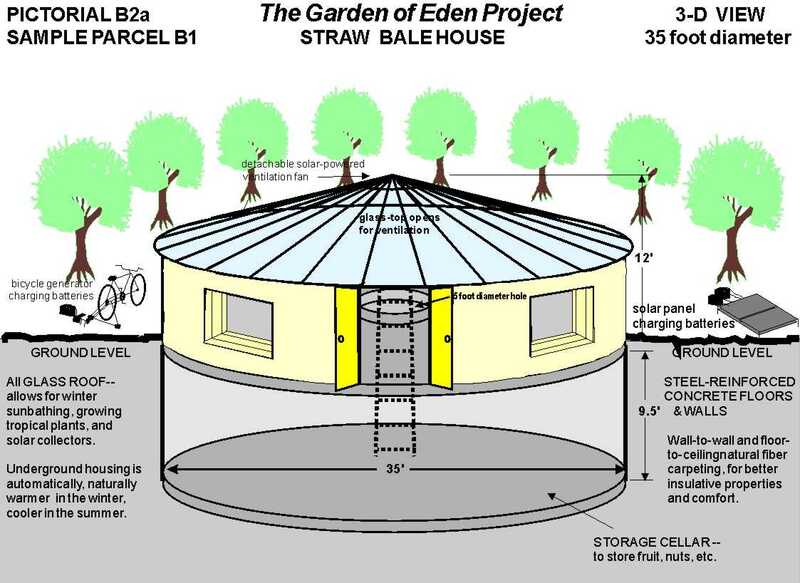 Plastered straw bale houses would make excellent, cheap, ecological and quick-built housing. These structures are known to be very quiet inside, due to the thickness of the walls. They also insulate against cold and hot weather very well!